The Easter Conference Finals will be decided tomorrow, May 27th in Boston. 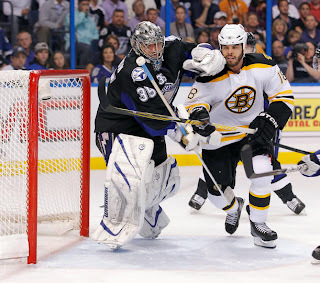 Both the Boston Bruins and Tampa Bay Lightning will be heading into game seven looking for the deciding win that will propel the winning team into the Stanley Cup Finals to face the Vancouver Canucks of the Western Conference. The Lightning forced a winner take all game, in Boston's TD Garden after closing out a must win game six in Tampa Bay. The Lightning over came a 2-1 deficit scoring three goals in the second period and surviving a Bruins' rally winning game six 5-4. Tampa was supported by their number one line of Steven Stamkos, Vincent Lacavalier, and Martin St. Louis, who combined for eight points on the night and scored the game winning goal off the stick of St. Louis. Boston on the other hand, obtained three of their four goals off of shots by David Krejci, who recorded the hattrick. Boston's TD Garden will be an absolute mad house come time for puck drop, with the home crowd trying to will their home team into the finals, hoping they can see another set of home games in the next round. However, don't expect Tampa Bay to be shaken easily, having gone 6-3 on the road through out the course of these playoffs. Oh, and don't forget Lightning goaltender, Dwayne Roloson extended his unbeaten streak to 7-0 when facing elimination, can you say clutch. Both teams will come into game seven having played 17 games, winning 11 and being one win away from having a shot at playing the Canucks and hoisting the Stanley Cup in just a few weeks.